ONE day, Ralph R. Eno, employed in New York as wallpaper salesman, noticed in a show window the first popular-priced motion-picture camera he had ever seen. “If people would only show more interest in my wallpaper,” he thought to himself, “I would buy a movie camera and have a lot of fun with it.” On further reflection, he decided to buy the camera and projector anyhow. With a natural artistic sense, in a few weeks he had become an expert in making amateur movies. When he showed his pictures to friends they recognized them as better than other amateur movies they had seen. The explanation was that Eno knew what to leave out and how to rearrange pictures with a view to a natural unfolding of scenes. In other words, he was a good film editor. Then he began to experiment with titles. One day he wondered if he could do his work even better under instruction. He inquired but found no one in that line of work. So he went to dealers in photographic supplies and obtained their promise to put him in touch with anybody needing titles or editing, but they had little faith in finding any demand for such services. Nevertheless, Eno did meet a man, a millionaire, who had been traveling about the world and had about nine miles of film. 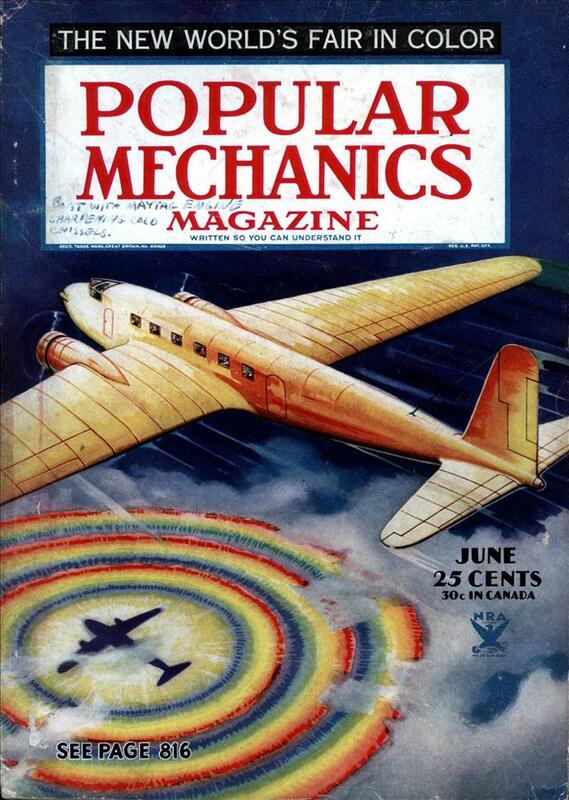 It contained interesting material about far-away places, but the pictures were in a jumble. In other words, like many another amateur, he had lost interest in his pictures because the job was incomplete. Eno worked for many weeks, rearranging pictures and inserting artistic titles. At times the man was shocked at the ruthless manner in which Eno omitted yard after yard of his material. But when the job was done, he was so pleased with the result that he paid the bill, about $9,000, without a protest. That first customer told his friends about Eno and today his callers actually get in one another’s way. Eno’s customers are by no means con- fined to the wealthy. Scores of them are humble clerks whose hobby is making a permanent record of activities of their children as they grow up. One such film is an amazing piece of editing. It shows a little boy from the time he was a few hours old until he was a husky big youngster, and yet this life story unfolds so gradually that the boy appears to grow right before one’s eyes. He goes from one room to another after a toy and when he returns he is a wee bit bigger! The father hopes to have a filmed story of this lad’s life from birth to manhood. Thousands of people are keeping pictorial family records, Eno says. He gets such films for editing from all parts of the world and recently was working on one from Tasmania. During the depression, Eno’s business showed a great increase. When men are idle or discouraged they turn to their hobbies to help them forget their troubles. A man can’t buy films if he has no money; but so long as he has any funds left, he will do without something else for the sake of cultivating his hobby. Moreover, when he can’t afford new pictures, he is all the more interested in trying to improve what he has already taken. At all events, this man who stumbled upon a new profession, now has so many customers he is compelled to make appointments days ahead. There’s nothing like meeting a millionaire to get you started in business. The Ralph Eno company operated well into at least the 1950’s. Title-making services for home movie buffs were offered both by industry giants like Kodak and Bell & Howell and by numerous small companies. One of the last was probably Harry Hilfinger’s ES-O-S film lab in Kansas City, which still offered expertly hand-lettered custom titles for around $3. each well into the late 1970’s or early 80’s. The Ralph Eno Company was still active at least well into the 1950’s. 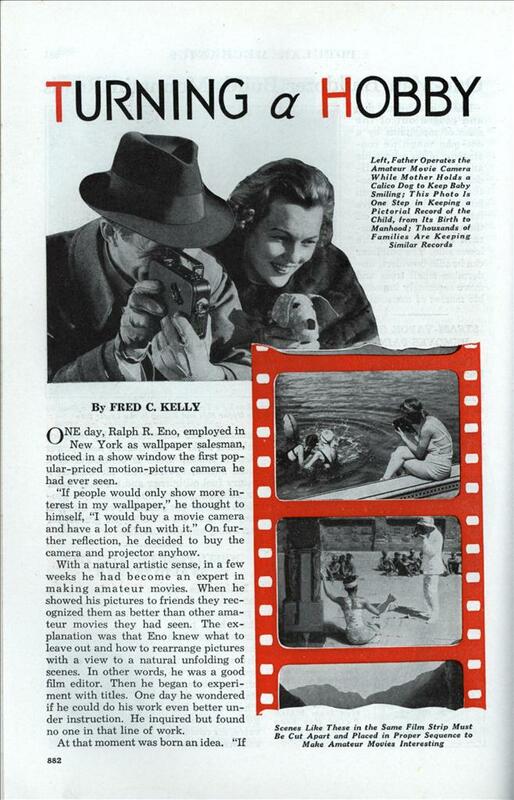 Photography and home movie hobbyist magazines carried ads for many companies offering title-making services; from industry giants like Eastman Kodak and Bell & Howell to any number of small operations. The last survivor may have been Harry Hilfinger’s ES-O-S Film Lab in Kansas City, which still offered hand-lettered custom movie titles in 8mm or 16mm for a few dollars each well into the late 1970’s or possibly even the early 80’s.